Karen Blanquart and Allison Potts, founders of Brazen Shop + Studio in Bellingham, had both tucked the dream of ownership into the caverns of their minds long before they ever met. Things changed with their experience as vendors at The Bureau, the original hub for Good Time Girls historical tours. The Bureau featured local artisans curated by Sara Holodnick. Karen sold her nature-inspired paintings and prints there, and Allison sold her brass jewelry and other handmade goods. The Bureau became a real home for their art. When The Bureau closed in December 2016 they searched for new places to show and sell their work. The two had come to appreciate Sara Holodnick’s nurturing curatorship. Eventually the trio launched The Aftermath Collective with other orphaned vendors and began appearing at local pop-up venues in Bellingham. Karen and Allison got to “play store” with the benefit of Sara’s experience and mentorship. This arrangement and the success of the pop-ups fueled the idea of having their own place. So they began strategizing. 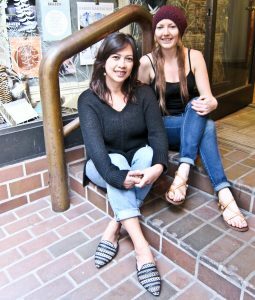 When The Allery Fine Art Gallery had to close, owner/artist Kat Houseman thought of Karen and Allison. She contacted them and, just like that, Brazen Shop + Studio became a reality. Brazen also means made of brass, which Allison uses for her jewelry. Brass, as it turns out, is made from two metals that create a new alloy. 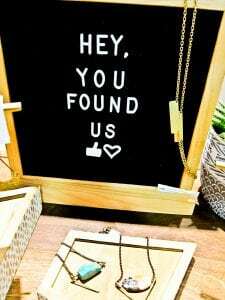 “We are two women collaborating to form a new shop and create goods, strengthened by each other’s creativity,” they declare. The stylized hare on the shop logo has special meaning for Karen and Allison. The hare is a cautious creature that moves through its fear, and serves as a reminder that their business is fertile with creativity and new ideas. 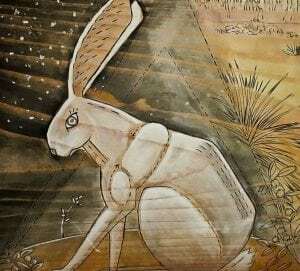 Karen often has a hare depicted in her paintings. Once while vacationing at California’s Joshua Tree National Park, she was walking in the desert alone. She heard a noise and saw a large hare up on a hill. The hare and she calmly looked at each other. It was a magical moment. With that in mind, the hare is a fitting logo for Brazen Shop + Studio. Karen and her husband, Adam, moved to Bellingham from Illinois in 2013. They left jobs and family to be closer to the beauty of the Pacific Northwest. Karen’s art expresses her sense of wonder at the nature around her. With the support and encouragement of her husband, she decided to create art full time in 2017. Allison grew up in Ferndale, WA and has worked for Premier Printing since the age of 14. Joey, her boyfriend of many years, recently asked her to marry him. (She said yes!) 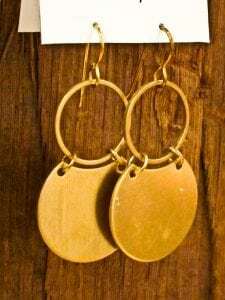 Her main focus is jewelry made of brass, but both she and Karen are trying other ideas, including collaborative art projects. Allison was more hesitant to dive into store ownership. Karen encouraged and Sara reassured, helping both of them to make their dream a reality. Brazen currently has a variety of vendors whose work is sold on consignment. Visitors can purchase art and other products from Karen Blanquart Art, Bird in Hand Design, Allen Berry (woodcarver), MP Soapworks, Sea Witch Botanicals, Heart Strings, Verso Jewelry, The Little Refinery, Red Boots Design, The Winter Bee Project, Miksi Goods, Some Girls Pottery and Sara Galactica. The shop also hosts solo artist installations for monthly Downtown Bellingham Art Walks. The official March 2018 opening drew a standing-room-only crowd, and the community offered a huge show of support. Visitors were drawn to a large Thelma and Louise themed painting by featured artist Kathryn Hackney. A lot of the goods for sale at Brazen are inspired by the ‘60s, ‘70s and ‘80s because Karen and Allison love nostalgic culture. They describe themselves as naturally inspired and comfortably modern. Karen and Allison are just delighted to be shop owners. Their excitement about Brazen is contagious. Karen says she loves having studio space that allows her to work on her art somewhere besides her kitchen. They both enjoy experimenting and answering that “Do I like making this?” question. The two have discovered incredible freedom in store ownership. They make their own rules. 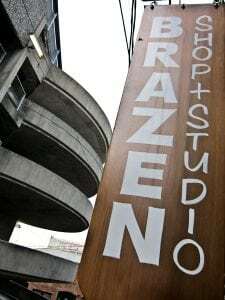 Brazen Shop + Studio is a bit of an adventure to locate, but that’s part of the fun! The entrance is in the alley between Cornwall Ave. and Commercial St. in downtown Bellingham. Go through the brick archway behind the Commercial Street Parking Garage and you’ll be in the right place. After only three months, the shop is drawing repeat customers who say they love its feel. For many, Brazen is their go-to place for gifts. Vendors stock often so the inventory of goods is ever-changing and plentiful. Karen and Allison look forward to being part of Downtown Bellingham’s energy, and encourage you to stop in. They are open from 11:00 a.m. – 6:00 p.m. Tuesday – Saturday.